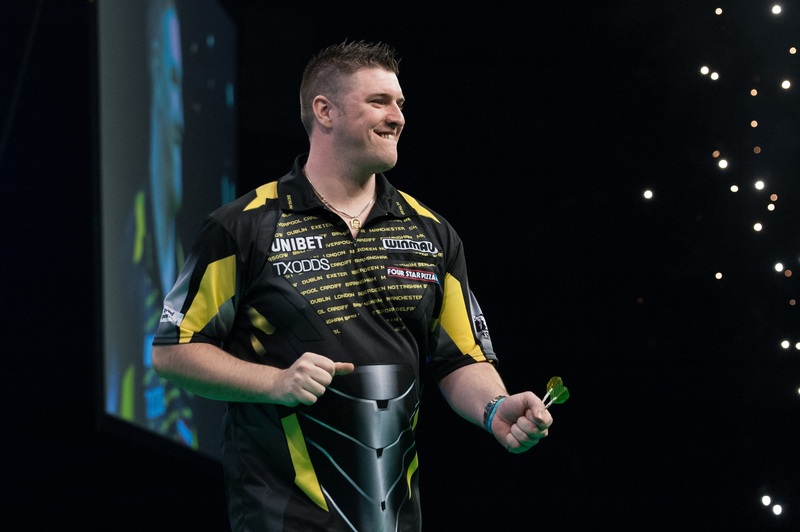 THE second half of the Unibet Premier League season begins at The SSE Arena in Belfast on Thursday, as Northern Ireland's Daryl Gurney bids to continue his Play-Off surge against Rob Cross. Following the elimination of Raymond van Barneveld after last week's double-header in Rotterdam, the remaining eight players are now battling for four spots in May's Play-Offs. The first of seven further league nights sees the Premier League return to Belfast, where Gurney enjoyed a memorable victory in his first appearance at The SSE Arena 12 months ago. Gurney also took on Cross on that occasion, winning 7-5, and returns to Northern Ireland in fourth place in the league table after winning his last three games. Victory in the German Darts Championship on the PDC's European Tour circuit last weekend also moved Gurney up to third on the PDC Order of Merit, leaving him in confident mood. "I absolutely cannot wait for Thursday night," said Gurney. "I was already over the moon to be returning to Belfast and to win my first European Tour event just a few days before it is the perfect start. "I'll be in the mode where I don't want to be beaten but to be the best, you've got to beat the best and I'll be trying my damnedest. "I'm not as consistently good as Rob, Michael van Gerwen or James Wade but I'm looking to get into the top four." "I played a Dutchman, Jeffrey de Zwaan, in Rotterdam last week and I know the crowd will be behind Daryl too but I'm looking forward to it," said Cross. "Daryl's playing great darts at the moment and he's a fantastic guy. "I had to dig in last week to win against Jeffrey but that's not a bad thing to have a battle like that. I hit some big scores at important times and my game's been pretty good recently. "I've got to keep doing what I've been doing but I'm playing well. I've shown some character recently and I've needed to do that." Van Gerwen defeated both Peter Wright and Van Barneveld by 7-1 scorelines in Rotterdam, and is looking to continue his push to top the league table when he faces Gerwyn Price in Belfast. "I performed really well in Rotterdam and it's set me up well for the rest of the Premier League," said Van Gerwen. "I'm really happy with how things are going and I've got a lot of confidence now, but I have to stay focused. It's still going to be a long journey towards London but I'm looking forward to it." The visit to Belfast also sees third-placed James Wade come up against Mensur Suljovic, while Peter Wright meets Michael Smith. 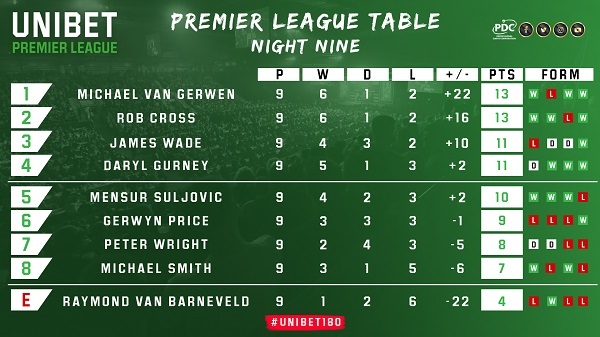 2018 Premier League finalist Smith sits in eighth place going into the second half of the season, but is only four points away from the top four in a congested league table. Tickets for Thursday's Unibet Premier League at The SSE Arena in Belfast are still available by calling 028 9073 9074 or by clicking here. Night Ten of the Unibet Premier League in Belfast will be shown live on Sky Sports, worldwide through the PDC's broadcast partners, and through PDCTV-HD for Rest of the World Subscribers.